As the world's third largest economy, Japan is leading the way for aging societies. 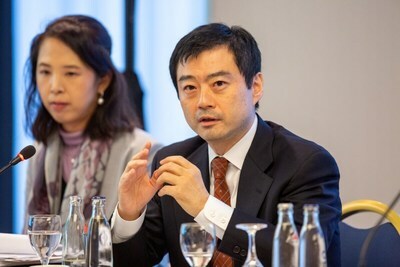 Therefore, the Government of Japan has launched series of roundtable events across Europe highlighting the substantial opportunities for collaboration in the healthcare sector between Europe, especially Germany, and Japan. At a roundtable event titled "Open for Business: Capitalising on Japan's Digital Healthcare Economy during this Era of Aging Societies" in Munich on November 21, the discussion highlighted the shared opportunities the world's top two "super-aged" countries should embrace, and how German businesses can take advantage of new commercial benefits presented by aging societies. 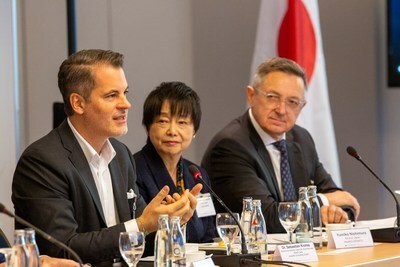 The event was supported by The Japan Agency for Medical Research and Development (AMED) and the Japan External Trade Organization (JETRO) Duesseldorf. The engaging discussion was moderated by Erwin Böttinger, Head of the Digital Health Center and Professor for Digital Health and Personalized Medicine at Hasso-Plattner Institute, and featured Sebastian Krolop, Partner and Industry Lead Life Sciences and Health Care, Deloitte Consulting GmbH, Shinsuke Muto, Chairman, Integrity Healthcare Co., Ltd., Yumiko Nishimura, Advisor-Japan, Health 2.0/HIMSS and Kazumi Nishikawa, Director, Healthcare Industries Division, Commerce and Service Industry Policy Group, Ministry of Economy, Trade and Industry of Japan, who joined via video conference from Japan. The speakers discussed how Japan is well placed to serve as the world's test bed for the emerging digital healthcare economy in this era of aging societies. The country's high quality data around medical, health and long term care, generated from the country's universal healthcare system covering its 127 million citizens, is hugely attractive to scientists and businesses. In addition, advanced technology in Japan, including Artificial Intelligence and the Internet of Things, coupled with access to data, is opening the door to new business creation in fields such as medical devices and digital health services. This changing healthcare landscape of the country presents immense collaborative opportunities between Germany and Japan. "In Germany, there is a lot to improve: Now it is time to use the great data Japan provides to start the flow. Your data is the oil that gets the engine started." - Sebastian Krolop, Partner and Industry Lead Life Sciences and Health Care, Deloitte Consulting GmbH. "As a doctor we tend to focus on individual patients - however, to improve overall care, more comprehensive data is needed. We strongly believe that physicians will benefit and generate very valuable learnings from the analysis of Japans database," - Shinsuke Muto, Chairman, Integrity Healthcare Co., Ltd. The Government of Japan continues to transform its market to meet the needs of worldwide businesses by providing world-leading, high-value business environment that enables companies to expand and thrive. Germany and Japan are already considered as "super-aged," with more than one in five citizens aged 65 or older. Taking this unprecedented challenge as a transformative opportunity, the Government of Japan is working on implementing a new patient-oriented healthcare system by 2020. This initiative includes data and technological innovations to promote healthier lifestyles. Therefore, the country is generating new and exciting economic opportunities, while aligning its regulations with those of other advanced economies to enable seamless integration for companies ready to expand into new growth markets. The final event of the Government of Japan's "Open for Business" roundtable series will take place in Paris on 22 November 2018, and will focus on entrepreneurship and start-ups. Please click here to learn more about the Government of Japan.